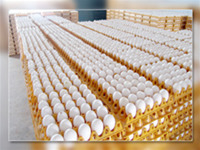 Chicken eggs are widely used in many types of dishes, both sweet and savory, including many baked goods. Eggs can be scrambled, fried, hard-boiled, soft-boiled, pickled, and refrigerated. They can also be eaten raw, though this is not recommended for people who may be especially susceptible to salmonella, such as the elderly, the infirm, or pregnant women. In addition, the protein in raw eggs is only 51% bio-available, whereas that of a cooked egg is nearer 91% bio-available, meaning the protein of cooked eggs is nearly twice as absorbable as the protein from raw eggs. As an ingredient, egg yolks are an important emulsifier in the kitchen, and the proteins in egg white allow it to form foams and aerated dishes. the albumen, or egg white, contains protein but little or no fat, and can be used in cooking separately from the yolk. Egg whites may be aerated or whipped to a light, fluffy consistency and are often used in desserts such as meringues and mousse. Ground egg shells are sometimes used as a food additive to deliver calcium. [every part of an egg is edible, although the eggshell is generally discarded.